Nobody would have dreamt that in a village barely exceeding four hundred people, a football team could ever be established. However, this is what happened in Munxar in 1972. A group of keen enthusiasts, spurred on by the avid football hunger of a bunch of youngsters, officially set up the Munxar Falcons Football Club. 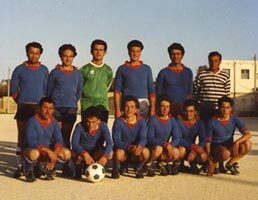 That year the team, impelled by the great spirit of adventure, participated in the GYFA (Gozo Youth Football Association), a subsidiary of the GFA (Gozo Football Association). Daring and willpower were crowned the following season, when the Falcons won the GYFA Championship. Following the dissolution of the GYFA, the senior team remained inactive for the 1974/1975 season, when the club got involved in the GFA minor league. 1976 marked the official entrance of the Munxar Falcons F.C. in the GFA Second Division League. Campaigns were tough-going, with alternate periods of ups and downs, but dedication and generosity were never lacking. During a twelve-year span in the Second Division, the Club won the GFA Second Division Knock-Out Competition twice. The early 1980’s signalled the shape of things to come by the re-launching of the minor team, a tightly-knit family-group of highly-skilled players. This move would pay rich dividends in the years to come. In 1988/89 our Club won promotion to the First Division for the first time, only to be bundled back into the lower Division the following year. But the evident high quality of the team was not to be denied. In 1990/91, the Falcons regained promotion with flying colours, winning six trophies in a single season, including the Second Division Championship and the Knock-Out Trophy. Undoubtedly, in terms of silverware, it has been, and still is, our most successful season. Fighting against great financial odds our Club remained in the highest Gozitan Division for six consecutive seasons, a feat unparalleled by any club of similar size. The best placing was achieved in 1994/95 when the Falcons put on a great challenge for the League, managing to finish third. Following this achievement, owing to a combination of factors, the Club’s fortunes reached their nadir. Being relegated to the lowest Division of three, the Falcons had also to suffer the indignity of heavy defeats. Before the dawning of the new millennium, at the end of the 1999/2000 season, the Club ceased taking part in the GFA competitions at senior level, but the seeds of a possible revival in the near future have been preserved. In fact after a seven-year spell without senior team activity a collective effort has led to a momentous decision - the return to the G.F.A. Second Division as of the season 2007/08. Throughout its history our Club has always striven to build its fortunes on home-grown youths, attracting the children born in the village. 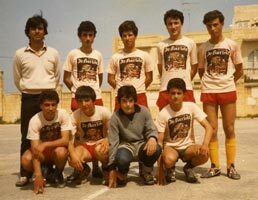 Our Club made its debut in a youth championship upon its foundation, competing again in the minors’ competitions in the early 80s when a bunch of youngsters grew up and carried our Club to never-thought-of achievements during the following fifteen years. After the decision to remain inactive at senior level was taken, our Club has sought to build its future through a strong Nursery. Thanks to concerted effort by some old hands with the help of newcomers and supported by the Parish and the Local Council we now have a valid nursery with up-coming promising teams, of which one has matured to be able to compete in the Under 19 League. We also boast a group of youths, forming three promising squads. Two of them, namely the Under 12 and Under 14 are competing with alternate fortunes in the GYFA leagues. Our Under 10 squad is also promising, following the way traced by their forerunners in the early 80s. The efforts and costs are demanding indeed but with everyone’s contribution we are confident of making it through. Now that we have re-launched the Senior squad, we are bracing ourselves for the forthcoming challenges of playing again in the G.F.A. 's Second Division League. In certain ways ours is a new beginning, in others, it is a continuation of a great adventure launched over thirty-five years ago. Retrospectively, Munxar Falcons F.C. has indeed been a great achievement, not only in regard to the extraordinary accomplishment of its establishment, but more so of its subsistence. Photogallery - Click on thumbnails to enlarge!